Asymmetry played a large role in the thinking of Karl Popper: not just the asymmetry between verification and falsifiability, but the deeper asymmetry between perfection and imperfection. I've been thinking about this with regard to music, particularly as I've been playing a lot of Bach recently. Whatever symmetry which gives this music its transcendent perfection is something which is at once precious, fragile and rare but also essentially fundamental. In the hands of great performer, its power is breathtaking. Our inclination logically is to think of music as a sequence of events which produce a certain effect (or affect). This view is conditioned by a certain thinking about the causal relationship between making the sound and feeling a feeling. But is this really what's going on? Because, what is apparent in the experience of the music is an emerging sense of one-ness brought about through the revealing of a harmony between personal being and an outside environment. The one-ness is the bringing together of the inner-world and the outer world. And the feeling of balance is, I wonder, precisely to do with symmetry. Which is odd. Because we tend to think of such phenomena as being about time. And in thinking about time, we become aware of what we expect to happen next, and what we think has just happened. This was the subject of my paper for Kybernetes here: http://www.emeraldinsight.com/journals.htm?articleid=1949443. Memory, cognition and music are all inter-related in ways which demand new thinking about how the inner-world and outer-world relate. I want to go further now, and suggest that the key to this view is understanding the nature of anticipation. In my paper, I characterised anticipation as the natural consequence of reorganisation in response to environmental stimuli (even if those 'environmental stimuli' was the twitch of an eyeball, or an itch, or a breath). The essential question is what drives the reorganisational response to behave as it does? The answer that I am thinking through is "symmetry between internal regulation and external perturbation". My paper references Luhmann (although I struggled to get this accepted by the ASC who don't like Luhmann very much - I suspect he's too much of a realist for them! [ironically, he's too much of a constructivist for the realists!]). Recently, I noticed an interesting paper by Wolfgang Fuhrmann on Luhmann and Music in Acta Musicologica. There needs to be more stuff like this! Luhmann's work is all about the balance between outer and inner worlds (what he's calls social and psychic systems). However, Luhmann does not go into the details of anticipation. Leydesdorff has done this, and it does seem to be the key thing to understand and where important work can be done. What's exciting me most is the fact that anticipation is such a 'holy grail' in the social sciences. If we can produce models that provide reasonable short-term forecasting, then the institutional control that will result will be a major social shift (the economic crisis may be precisely the result of lack of anticipation and control of social institutions). In essence it is the ability to 'listen' at the social level. Music is where anticipation most clearly reveals itself as an object of study. So just for once perhaps, musicology and sociology might produce something useful (just as Hermann Hesse always thought it would - the two most important disciplines in the construction of the "Glass Bead Game" where mathematics and music!). About 9 years ago, my attention was drawn to a major change in the technological infrastructure of the web. Capitalising on the fact that populations of many western countries were wiring themselves up with fast broadband connections, and given the rising dominance of XML as a data transport layer, WebServices presented themselves as a means by which the web could be leveraged in new ways that allowed for the discrete functionalities of systems to be repurposed - both by institutions and by users. The resulting flexibility of this technical shift created a lot of excitement in the e-learning world, where the interoperability between systems, together with the dominance of large-scale 'monolithic' systems had long been seen as stumbling blocks to the long-term sustainability of learning technologies. In many ways, we're still there. But there's something very new happening, which I believe will have an equally transformative effect. This is W3C WebSockets. The similarity to WebServices goes about as far as the similarity of the two names. WebServices were fundamentally about XML data files; WebSockets are fundamentally about streams. This is not new in computing... we have been here before - even from early Unix years. But this time, we are talking about streams which run through web browsers: the HTML5 specification has in-built support for WebSockets. WebSockets are fast: the speed of interactivity between services makes a radical break with technologies like AJAX, and that means very new things become possible (see for example https://labs.ericsson.com/developer-community/blog/beyond-html5-conversational-voice-and-video-implemented-webkit-gtk). WebSockets can be used to overcome institutional hurdles which would be blocked using other techniques. WebSockets can be leveraged by teachers to create servers to host their learners as clients: this overcomes the problems of 'flatness' and control with using Web2.0 technologies. WebSockets emphasise streams over files. Potentially this has a lot of implications for the way we think about interoperability. Rather than defining XML file formats, we may need to think about other (probably API-based) ways in which streaming services can talk to each other. The speed of WebSocket services makes levels of interactivity and rich collaboration possible that we currently only know through the provision of big corporations like Skype. WebSockets promise each of us the capacity to run our own Skype-like services. And to get a flavour of what might follow, it's worth thinking about those internet services which have already embraced streams as their model. Spotify has made the most powerful challenge to physical media in a very short space of time. This week, the 'Spotify for games', at http://onlive.com promises to do the same thing for the games industry. What would a VLE look like with this hugely rich interface using these techniques?? It's probably a sign of things to come. But I'm most interested in the way this rich real-timeness can bring people together in new forms of activity. I think that's our best chance of realising different sorts of pedagogies - particularly those which focus on the emotional impediments to learning. And I'm interested not in the big streaming services of Spotify, Skype or OnLive, but in the rich streaming services which soon will be within the grasp of teachers. Erich Fromm's work on individuation is very closely related to Illich's work on conviviality. The two men were friends. Yet, conviviality seems to be the opposite of the 'individualised' consumer society that we see before us. But individuation is radically different from individualisation. Indeed, for Fromm, the individualisation of capitalism is actually an example of what he calls "automaton conformity": the subjugation of the individual to the collective as a result of personal anxiety. "The psychological path of individuation is ultimately a preparation for death"
Beyond this, individuation is an acknowledgement of identity and selfhood as it is constituted both from within and without. The latter's importance is the connection of identity to the relations to those around us, and the role of individual action in constituting self as well as carry the moral responsibility for the constitution of others' selves. Harre's Positioning Theory is the latest (and possibly the clearest) identification of this aspect of selfhood. Finally, I think individuation involves some awareness of the relationship between aesthetics and ethics: of the essential balance of action and the harmony and symmetry of relationships. I think the central focus of this balance lies in the nature of attachments both to others and to things. In this way, individuation is not at all 'selfish' - its view of the self is essentially where the inner world and the collective combine. Individualisation or personalisation on the other hand, has a narrow and naive concept of self, drawn from enlightenment philosophies and effectively hijacked by consumerism. Consumerism has sought to constitute individual identity through the mass attachment to commodities. Often this comes at the cost of attachments to each other. The economic mechanisms create risks around the attachments to commodities and people as a way of creating new needs for attachments to new commodities and increasingly services. Services have arisen because they are more easily manipulated as objects of attachment as ways of creating ever-new risks and anxieties. Such risks are essentially global in character. The current financial crisis is a classic example of the production of 'global risk': the threat to each individual is the threat of loss of identity through loss of objects to which they are attached - the house, the car, the job, etc. To the truly individuated person, such risks are hollow: preparation for death is precisely the realisation of what matters - and it is other people that matter. In this way, individuation and conviviality can present new paradigms for living. Convivial local groups can protect against global risk. Such global risk presents some striking anomalies. An example is presented in the "global" risk of "global warming". With global warming, the anxiety is that "we will all die". Notwithstanding the real and (in my opinion) incontestable effects of the accumulation of human-produced Carbon Dioxide in the atmosphere, there are some problems here. On the one hand, since humankind is seen as the cause of global warming, if "we all die", then the loss of the cause of the problem brings the necessary correction. On the other hand, whilst the fear that "we all die" is fully engaged with, the certainty that "I will die" does not enter the equation. However, global warming is probably most accurately characterised as a sort of collective moral angst - that somehow the failure of coordinated action to prevent collective death is a collective moral failure. But there is nothing collective in the anxiety. What lies behind this? I think the answer is once more about identity and attachment. The fear, similar in character to the economic crisis, is that individual identity is lost through the loss of objects and people to whom we are attached. It may be that the deepest fear is of the loss of those loved ones to whom we are most attached. For example, although it is not natural for us to be predeceased by our children, history has shown a fluctuating statistical probability that this might happen (100 years ago, it was not unusual at all). As we live longer, we may be faced with similar statistical possibilities. In this way, the fundamental character of "global warming" is of a global political movement of anxiety creation whose motives and direction are not at all clear, but generally expressive of the existential problems of modernity. With our current global risks of the economy and the manufactured risks associated with consumerism, the combination of conviviality and individuation presents a ray of hope. Technology may have something to contribute here. I think conviviality depends on the management of value pluralism through the coordination of activity. Such activities can be coordinated through technology, and the increasingly real-time technologies that are now presenting themselves may provide a powerful boost to the emergence of really innovative online engagements between people. One of the risks that is produced by managerialism is competency. For those without them, competencies are experienced as absence and anxiety. These anxieties (risks) are institutionally produced - indeed the culture of the production of the 'competency-risk' in many cases goes up to the definition of 'occupational profiles' of national governments (this is particularly the case for Italy, Germany and the Netherlands). Within education, the competency of teachers is another point of risk-creation. Competency frameworks identifying 'good' and 'bad' teachers or academics now carry real risks for individuals who are already in their jobs, with rising anxieties as "jobs are on-the-line". Managerialism can exploit these anxieties to address issues of financial viability and directing professional practice in particular directions whilst dancing around restrictions concerning the termination of employment. Very soon sight is lost of the fact that while the risks and the associated anxieties of such competencies are real (albeit manufactured), their deeper ontological foundations in what is 'good' and 'bad' in education are much less certain, tied-up as it is in the perennial paradoxes of the nature of education and human cultivation. "In a convivial society (and a convivial education system) how are the different skills and attributes of individuals recognised, if creating risk around competency is to be ruled-out?" The answer to this starts to appear when we ask "what happens when people come together?". This requires some thought-experiments. Togetherness is by its nature a diverse web of relationships, not a flat plain. Some people are good at certain things, and in a convivial environment we know who they are. We do not necessarily need to have a piece of paper that tells us who they are. But surely different people will have different opinions of who is good and who is not? I think the nature of the convivial society embraces value pluralism. Thinking about this leads me to think of the distinction between managerialism and governance. Governance seeks to manage value pluralism and maintain conviviality: the principal mechanism for this is to coordinate activity. This is very similar to the arguments I presented in our recent special issue of Campus Wide Information Systems: http://www.emeraldinsight.com/journals.htm?issn=1065-0741&volume=28&issue=4&PHPSESSID=pk05nh9ouc8mgs39jicv56jpm4. Managerialism seeks to coerce behaviour is particular ways: the principal mechanism is to create institutionalised risk. Competency falls into the latter category. But then again... as I write this I think "competency isn't going to go away." But it has the character of something global: generalised ideals to which all individuals are meant to conform. And here, there is another way of looking at the issue. It becomes another example of the need to balance global concerns with local needs. Maybe think this can be achieved through the governance of convivial education within institutions, which acts as the interface between the deep human needs of individuals and collectives and the global demands of competency frameworks. But given that, governance is what institutions need, not managerialism. Exploring a technical architecture for a "Convivial Learning Enviromnment"
The principal impediment to learning is emotion. In the back-streets of Rio Freire dealt with the emotions, teaching illiterate kids to read and do maths. The highly unusual way he did it has been an inspiration to teachers ever since. Boal took on these ideas, developing theatrical activities which could be used in different locations to loosen up channels of communication - particularly within those who were usually too timid to speak out. But by creating safe situations for people to explore their feelings and express themselves, both Boal and Freire sought to teach through 'unblocking'. But importantly, these techniques depended on people being together, sharing in an experience, caring for each other. How could such situations be engineered online in ways which can be ready-to-hand for teachers in classrooms now? Can technology provide new ways of encouraging the sort of pedagogical approaches pioneered by Freire? Can technology, which until now has at best been a rather cold experience, be a vehicle for something profoundly human, warm and convivial? The technologies for activity leaders needs to be almost as easy, although teachers/leaders can manage the complexity of their own machines in a preparing an activity, providing they know that the control of that activity is ready-to-hand for learners. Whatever is done by a teacher must be easily reproducible by other teachers. I've long thought that the principle advantage of the Wookie Widget Server is its ability to bring technologies to-hand easily in a variety of different environments (VLEs, blogs, mobile (nearly)). So I had conceived of 'controllers' which were Wookie Widgets that could collectively control things that happened on a teacher's machine. Inspired by Pauline Oliveros's 'deep listening' exercises (which are very like Boal's dramatic activities), I decided that I would like to create a convivial musical environment, where sounds could be contributed to the environment by individuals engaging with controllers. The architecture for this set-up involved establishing a web-socket based chat server on the web. The purpose of this server was simply to forward messages from those clients that connected to it via a WebSocket connection. I then wrote two 'clients' for this service. One of them was a Java applet designed to be a Wookie Widget (which is just a matter of wrapping the Applet in a W3C Widget zip file). The other client was a Java Application, which similarly connected to the same WebSocket, but which was designed to interact directly with other applications on the local machine through sending UDP messages. In essence, this Java Application was the teacher's 'server'. But for it to do anything interesting, the teacher needed to think what would respond to those messages. In my case, I decided that I would like to make sound, so I used PureData (a real-time Digital Signal Processing engine) to create sounds on the teachers machine in direct response to the messages being sent from the server. And then I invited people to try clicking on my widget buttons. The response times were very quick, even when people were clicking in other parts of the world, so the immediacy of engaging with the control and something happening to a 'global' environment was quite striking.Each individual could see the difference they made to the environment that affected everyone else. This, I think, is the essence of the convivial pedagogies that Freire and Boal (and Oliveros) have experimented with. The only limits to thinking in this way are thinking about the different sorts of things that can actually change in the environment, and how that environment is presented to participants. Since I'm working on the iTEC project, my focus is on the classroom. Indeed, with this technique I think I can address my principal concern about widgets in iTEC, because the teacher clearly gets something out of using widgets in their lessons. However, there's no reason which environment which individuals contribute to cannot exist online: as an internet TV stream or radio. The key to such developments lie in the real-time web and WebSocket technology. In this way, my principle interest is in seeing if genuine convivial situations may be created where distributed individuals participate and experience rich shared experiences, and where different sorts of convivial pedagogy might be explored for the first time in online environments. Managerialism is the institutionalised creation of risks. It is the enemy of conviviality. Managerialism is concerned with individuals – indeed, what it sees as rather selfish individuals who are manipulated through the risks that managerialism creates to behave in certain ways: wanting certain things, avoiding other things, all for personal fear of falling victim to one risk or another. The anxieties which are the natural human response to managerialism’s risks are felt personally. And managerialism at its worst manipulates individual insecurities in cruel ways which only through the guile and cunning of clever higher-level risk management avoids the accusation of ‘victimisation’. Individual biology is always prone to this sort of manipulation because fundamentally, it is a manipulation of identity through altering attachment relationships (I have speculated on this before here: http://dailyimprovisation.blogspot.com/2011/07/listening-to-economy-brief-paper-for.html). Indeed, managers themselves are prone to managerial manipulation higher up the ‘food-chain’, and there the anxieties produced by one set of risks can have particularly pathological consequences further down the system. Anxiety produces rather bad policy! Attachments are fundamental in the establishment of identity and the strengthening of capacity to manage anxiety. Where attachments are strongest, society is at its most convivial. For Illich, such situations are the epitome of dignified humanity. But managerialism seeks to disrupt and sometimes sever individual attachments to one another. It has found ways of leveraging technology to help it to do this. It has found in the internet radical ways of rationalising and organising individualised risk, asserting ‘realities’ which are not ontologically grounded. It has exploited the resulting alienation to further its risk-produced manipulations. Because the whole economy is organised in this way, individuals appear helpless in the face of these forces. They are deprived of ways of being together because their attachments are subject to managerialism's interference. Not least the individuals who work or study in modern higher education - particularly in a risk-laden environment of rising fees and economic uncertainty. But technology has a surprising knack of upsetting the applecart. Whilst managerialism has leveraged most of the radical technologies of the last 10 years, its technological foresight is less effective. The technological and human need is to fly beneath the radar of institutional systems. The first attempt to do this was Web Services about 10 years ago. Web Services enabled the connecting of the functionalities of different systems together in ways which would work in most institutional environments. Unfortunately, corporate managerialism consumed most of these ideas, using them to find new ways of producing risk for individuals in the form of the big global social network enterprises. Now we have Web Sockets: the ability to create direct communication protocols between web pages, again without interfering with any of the high-level institutional security problems that usually plague socket-based communication. This is really new because it affords much richer real-time communications. Moreover, it enables those communications to be served and managed not by central services, but by ordinary individuals: setting-up a real-time communications server will become as easy as writing a blog. I find this interesting because it may provide a way in which individuals can re-find ways of being together, and engage in convivial activity. That’s important, because if the technology can genuinely support environments for rich attachments, then the risk culture of managerialism is undermined: the collective that looks after each other is more immune to individual risk manipulation than the fragmented social wastelands we are currently producing. Where has it taken us? What does education look like now? What's next? The "campaign to get teachers to use the internet" which started about 15 years ago has succeeded: teachers use the internet. Whilst the utopian hopes for transformation of the education system have not been realised, education in the world of the internet is a different place from education before it. And whilst many of those utopian hopes might not have been realistic, they gave the campaign for the use of the internet drive, political support and money. In terms of understanding where we are now, I think it is useful to think of the stages of the evolution of educational technology. As with most technology initiatives (as Illich tells us! ), the early days are the most interesting and possibly the most beneficial (particularly for the innovators). In the early days, a few teachers discovered technology and saw the educational potential in it. Nobody else knew what they were doing: it was a kind of 'black magic' which tended to capture the imagination of others, even if they had little understanding of where it might lead. So a teacher would bring into class their newly-acquired personal computer, or they would set up a discussion forum on the University's mainframe (which had up till then only been used for running Fortran programs of physicists and mathematicians). It was new, it felt revolutionary. No wonder people were inspired to think that the world of education could be transformed! a. how can technological practices be made accessible so everyone can do it? b. how can technological practices be organised and coordinated? c. how can technological practices be managed so as to reduce the risk to the institution? Firewalls, Virtual Learning Environments, massive PC roll-out programmes, Access policy management and an emerging ICT curriculum were the result. The universalising of internet-based practices were the principal legacy of the VLE - albeit, the main practice being the use of the technology as a 'giant photocopier'! PC rollouts created huge and largely new management problems for institutions. These problems were dealt with by leveraging the technologies to manage technological innovation (often, this effort was led by those early-adopting innovators who, having benefited from the freedom of experimentation without interference, now found themselves organising ways to restrict the freedom of others!). The result was a curtailment of technological freedom within the institution. Institutional curtailment went hand-in-hand with the rise in power of personal technology. Increasingly, there was an emerging disparity between institutional technology and personal technology. Individuals could do far more with their own technology than they could within the institution. Along with this process, and helped by the development of XML-based 'services' on the web, global services (run initially as start-ups, but often ending-up as global corporations) appealed to individuals by offering functionality which mirrored the provision of educational institutions, but which seemed to work better and be more effective, whilst not curtailing freedoms in the ways that institutions had. This process gave rise to debates about the 'locus of control' of technology in learning, otherwise known as the 'Personal Learning Environment'. Shift the provision of technology outside the institution, so learners could organise themselves with their own technology for their own learning journeys. This was not a new idea: similar pedagogical exhortations had been made in the 1960s before the internet, but the internet gave it new impetus, and finding resonance in the work of Illich who advocated the 'learning web' as an alternative to the educational institution. But the PLE muddied an already confusing picture. Teachers found themselves in the position of being curtailed by their institutions in the use of technology, but at the same time facing big organisational problems if they tried to use personal technologies with their learners because of the difficulties in being able to coordinate learning, and the fact that not all their learners were confident or happy subscribing to global services whose corporate agendas were somewhat opaque. Global services were aimed at individuals: they did not meet the needs of local groups or communities. More importantly, the types of activities that teachers could organise for their learners tended to become focused on text-based discussions. Each learner could now be relied on to have a device for text-based discussion, and so learning activities involved individuals with their personal technology participating in discussions. Or at least, some of them. Indeed, because discussion of this sort could be done online, there was a decreasing need to meet together. This trend suggested that those saying "the campus is dead" had a point. But online chat was simply the most available of the modes of engagement. It was the mode of engagement that could be accommodated most easily by the VLE or PLE. All that had to happen was agreement about which environment was to be used (e.g. VLE of Facebook?). The relationship between message and medium is interesting here. The message has always been shaped by the medium. Before the internet, the classroom was the principal frame. Early computers expanded the medium and created new possibilities. After e-learning, the frame of what is possible is what is most readily available in the technologies provided: typically this is online chat (either asynchronous or synchronous). After e-learning, technology can actually do much more than that. WebSockets and new developments in HTML make possible real-time engagements in ways which have not been possible before. Online gaming can bring together people in shared activities from across the world. Remote control can allow mass participation in experiments and artistic events. Haptic interaction can provide opportunities for physical engagement without physical co-presence. Video provides ways of personal revealing which go beyond textual communication. Hardware hacking allows individuals ways of interacting with their own physical devices. Biological hacking may be the next and (possibly more interesting) development in this sort of trend. But we're stuck with chat because of what technology has done to our institutions. We're stuck with chat because global services don't meet the needs of local communities, only individuals to whom they wish to sell their services. We're stuck with chat because we've now conditioned ourselves to expect chat from e-learning, just as we expected a lecture in the classroom. So we're ready for the new guerilla campaign. We're ready for the equivalent of the teacher who brings their PC into the class in 1982. It is the teacher who finds new ways of bringing their learners together and breaking the spell of 'me-first' chat technology. It is the teacher who creates the cool biological robot and invites their students to participate in controlling it. It is the teacher who conceives of online musical or dramatic performance with improvised participation from their learners. It is the teacher who does something remarkable and finds a way of sharing it to create a collective experience for their students. Currently, e-learning gets in the way of this sort of thing. But my wish is that the real-time web (WebSockets, etc) might provide a way of cutting through the technological red-tape and create a new moment in time when everything seems possible again. Illich Revisited: Was the Personal Learning Environment a mistake? Later on the discourse took a different form from our initial investigations, turning into a "PLE rules! Down with the VLE!".. which seemed a bit silly to us, since the VLE was clearly gaining adoption within institutions. More recently, as I look around at the various projects still trying to 'build' PLEs including the large-scale ROLE project http://www.role-project.eu/ , I'm wondering whether there was a wrong turning somewhere. Not that there's anything wrong with ROLE... but it is hard to see the technology being of practical use to teachers. This is for the reasons I wrote about regarding the ITEC project here: http://dailyimprovisation.blogspot.com/2011/09/interactive-whiteboards-personal.html. The problem of 'powering-up' learners without significantly 'powering-up' teachers to cope with them seems doomed to failure. This is leading me to go back to Ivan Illich, who was one of the principal inspirations behind the PLE idea (see http://www.tandfonline.com/doi/abs/10.1080/10494820701772652). His concepts of 'deschooling' and 'learning webs' bore a strong similarity to the capabilities of the technology. Now learners could be provided with the tools to self-organise. But on seeing what actually happened when we tried it, I think Illich would be the first to refine his message. The successor to Illich's book 'Deschooling society' was his 'Tools for Conviviality', where a more detailed analysis of technology and institutions and their rise in power, and the consequent loss of convivial existence is contained. When we started the PLE it looked like the web services of Google and Facebook (which hadn't really got going at that point) could present an opportunity for learners to do the things they needed to do away from the institution. But we didn't see the fact that we were replacing one institution with another even more powerful. We also thought the experiences of engaging with these services would be convivial in the way Illich describes. But Illich's message in Tools for Conviviality is to manage the power of technology: not to usurp it, but in certain cases restrict it. This is partly because any usurping would inevitably be done by a more powerful technology, thus increasing the pathology of technological power, not managing it. In our global world this challenge to manage powerful technologies has some resonance. Global services do not meet the needs of local conditions. Somehow we have to find ways in which the relationship between global services and local conditions can be managed. I think this is true of the internet (google, etc) and education. Local conditions in education are the conditions of the classroom. The teacher's job is to manage relationships with whatever tools they have to-hand. The tool that e-learning has given them that can most easily address the needs of the class is usually the VLE. The interesting thing about this is that the VLE still embodies the power relationship between teacher and student: the teacher has the editing rights, and students don't. Maybe because of this, teachers use it, because they still maintain the ability to amplify themselves and attenuate their students. If they were to use social software (Web2.0), they lose some of this control: the power relationship become much flatter. Consequently, fewer teachers are likely to do this because of the risks of losing control of their classes. In Illich's work on the relationship between technology and conviviality, I think he would now make some refinements in the light of the technology we have. Because it is not the power of the technology per se which does the damage to conviviality. It seems to be the flattening-out of power relations. In Illich's famous example of the spade vs. the JCB, the power relation between the boss and the workforce with spades was very marked: the boss was there to coordinate action. With the JCB, the technology enabled the worker to execute action autonomously, with the boss left to manage risks rather than coordinate action directly (and all the other workers who might once have used a shovel, to stand by and watch!). The JCB can be seen to have a flatter power differential between coordination and execution. I think the flat power differential can also be seen in Illich's concerns about institutions. As monasteries gained power, so the coordinating authority of the church and its relation to the essential Biblical teachings became challenged - each 'unit' became more autonomous and pathological, with increasing pathology in the centre too. But this is tricky territory because Illich has a problem with 'professions' (doctors, lawyers, etc) disempowering the population by creating 'health systems', 'welfare systems', 'transport systems', etc. But what's the real problem here? Is it the professional judgement of an individual and their authority over a patient? Or is it the fact that the 'system' created around them restricts their capacity to act in a sensible way? Here again, maybe the health system hated by Illich actually flattens the power differential between doctor and patient. The decline of power differentials seems to me to be entropic. Therefore, we might say that with increasing entropy in power, there is increasingly chaotic social form, or pathological morphogenetic processes. Seen this way, Illich's ideas about limiting the power of technology can be translated into a program of preserving certain types of power relations through technologies as technologies change. In my work, the power relation between teachers and learners is a key case. However, there is one important caveat to add. When talking about maintaining power relations between teachers and learners, I do not mean that we should all start lecturing and setting exams. Maintaining power relations does not mean poor positioning. It means instead empowering the teacher to position their students as they see fit in their local situation, thus reviving the convivial spirit of education. I've been asked to do a few sessions with some international students who are visiting Bolton from our overseas campus. I'd spent some time planning some cool (I thought) technological and cybernetic-related things to do related to their intellectual development and the need to improve their report-writing and research skills. It took a bit of setting-up servers, and jiggery-pokery in the computer lab to make things happen. For all my enthusiasm about this (which is the enthusiasm that most learning technologists have about technology), I realised that as a teacher I was in a 'techie' space that my students might not immediately appreciate. They were, after all, an inter-disciplinary group, with a minority of technologists, and a good number of mature students. So I stood back from my technological fever and asked myself "what do they need?" At that moment I became aware of a distinct change of mood in myself. My technological grand-plan had the feeling of some frantic 'scherzo' - a bit like a Tom and Jerry cartoon! It was all logic and the logic leading inexorably to new logical and technical conclusions... my thinking was heightened and fast, and I was excited... but at the same time... I had forgotten what I was really trying to do! Stepping back was the moment my mood changed. Suddenly, I was soulful and deep. Emotion was the key thing, and the need to connect with real problems and address them directly with a minimum of distraction. There are teaching and learning techniques I know for doing this (and have used many times before) - and this, I decided, was the best course of action. My feeling on this whole experience is that, as with music, it is the variety of moods and movements which makes the piece. And each mood carries benefits, but can be too much on its own. The technological "scherzo" mood is exciting and energetic, but it distracts and risks blinding us to what really matters. The soulful mood is deep and engaged, but can get stuck in introspection and a lack of dynamism. Then there are other moods: for example, the playing of games may be partly technological, but is also joyful: maybe that's the 'rondo' movement! And finally, there is the mood to inspire and be visionary. That is different too - because it doesn't necessarily have to connect to reality, but it has to steer the emotions of those present. What is the relationship between these things and forms of knowledge? What is the relationship between them and the different types of speech act involved, or the positioning involved? In what ways are they coercions? exhotations? or disruptions? I suspect we do all of them all the time to some extent. But being aware of the different modes of being, and developing the skill to switch from one to the other seems to me a sensible thing to do... and possibly a way of looking at the world more musically. The fact that online education is still a niche (albeit growing) market tells us something. Learners want to be together: in the lecture theatre, in the coffee bar, in the halls, 'down the pub'. But increasingly we see that the instinct to be together is counter-balanced by range of factors from the high costs of education and living away from home, to what appears to be an increasing individualisation and selfishness where individual financial investment in qualifications can be 'cashed-in' later on in terms of high wages. With rising costs of education, online education is likely to seem more attractive for these ends, and consequently the lecture theatre, coffee bar and especially the halls becomes something of a luxury. The common-sense instinct for conviviality is drowned out. In 1971, Ivan Illich documented this process in his 'Tools for Conviviality'. Technologies and institutions (which he saw as a kind of human technology), have a pattern: from a wonderful flowering where individuals are empowered (imagine how people felt with the first cars), the technology grows in power to the point that it threatens the viability of the world and alienates or oppresses the people in it (the car becomes a machine for covering the planet with concrete). Illich's recommendation is to limit the power of technology. Only by doing this can we preserve the fundamental values of human life which are only revealed in convivial existence. When I worked on the JISC Personal Learning Environment project a few years ago, I worried about Illich's argument. Technological personalisation, I thought, might be a route to conviviality because it counter-balanced what we saw as 'over-powerful' institutional technology. In the light of Facebook, Google and Twitter, I now think this is wrong. What personal and social technology has become is merely subservience to powerful institutions other than the university (i.e. multinational technology corporations). And more to the point, social technology is really a misnomer: it's personal technology for managing social connections strategically. It is rare (although not impossible) for people to have convivial engagements through the technology. A campaign for conviviality stands against the increasing emphasis on the individual benefits of learning as a way of justifying personal financial investment in educational institutions. As this ethos of personal exchange has gained acceptance, so institutional processes have become more focused on meeting individual needs (in the best spirit of customer service! ), helping the learner to manage their 'learning account'. The increasing emphasis on self has come at a price: 'learning journeys' take place individually. Pedagogical 'group working' does not change this: group work is as much about classroom management as it is about trying to nurture a collaborative and convivial spirit; achievements are ultimately individual. If individual targets are not met, the investment that the individual sees themselves making in education is lost. In such a climate of exchange, its perfectly reasonable for learners to develop strategies for success, and to equate greater success with higher marks. This is to the detriment not only of institutional life, but society in general. Our technological developments can (and mostly do) proceed to satisfy this increasing individualisation which is the focus of most university business plans. But equally, we could focus our attention on counter-balancing the loss of conviviality through the technologies we develop. A campaign to do this would essentially run against the individualistic and deterministic ethos of current educational thinking. But an effort to identify the tools and activities that bring people together in convivial ways is a necessary corrective to some of the pathologies that are occurring the education system at the moment. There's been a lot of talk recently about Global/Local with regard to a range of issues from public services to international finance. It's been less talked about in Education, but within Educational Technology the tension between global and local lies at the heart of some of the tensions and difficulties in using technology effectively in local situations. Basically, we have situation where there are powerful global services: Google, Microsoft, Apple, etc, but whilst they impress on an individual personalised basis, they don't always lend themselves easily to the convivial situation of the classroom: passwords must be set up, accounts created (with all their unpleasant legalese) before anything can happen. Some institutions have recently made global decisions on behalf of their students and effectively acted as resellers of these global services (for example, the OU's deal with Google: http://blog.ouseful.info/2010/01/22/open-university-adopts-google-apps-for-education/). But this leaves the student (and teachers) in an awkward situation where they risk getting more than they bargained for when they sign up for a course. I think global deals of this kind are a cop-out of a difficult technical problem which somehow has to be grasped. The central issue of localism is conviviality: at its essence is people looking after each other; of prioritising those individuals and places which/whom they have the deepest attachments. Localism in a global context is about behaving locally, maintaining attachments, and behaving convivially whilst being aware of the inter-connectedness of things and the opportunities and threats that emerge on a global basis, and how these might affect the local conditions. Fundamentally, it is about contextualised common-sense; about not being coerced by global conditions into behaving against ones better instincts and common sense. What has this got to do with teaching? Well, when we think about the local contexts in education, where the meaningful attachments exist, it is always in the convivial environment of the classroom. Indeed, the push for social software and online communities has precisely been a push to try to establish this sort of conviviality online. On the whole (with very few exceptions) it fails. Why? Because the conviviality of the classroom doesn't just emerge from people being together. It emerges from them being together in a way where they form attachments to each other and the situation they are in. For some reason the online networks still seem very cold - whilst students will (sometimes) converse, the conversation can seem inauthentic in comparison to the visceral experience of being in a place together. Much the same experience can happen in the theatre or at concerts, but the classroom is special because of the particular power relationships and agendas that play out there. Indeed, might it be the reduced level of power relationships online that contribute to their reduced level of conviviality? In the classroom, out of the power relationships emerge activities. In essence this is where the teacher exploits their position of power by attenuating the communication of their students. And good teachers will find all sorts of imaginative ways of doing this, but its net result is to create a viable situation for teachers and students to be together for the duration of the course. But the weird and magical thing about learning activities is that the attenuation of communication (the rules of the game) produces increased levels of attachment - not just between the students, the students and the teachers, but between the students and the subjects of study. And as that happens, the patterns of communication (the 'positionings') change. In the classroom 'enhanced' by social software promoted by the big global players in the computer industry, the natural thing to think is that this technology can be exploited to support the sort of activities that foster increased conviviality and deepening attachment. But the global players' software is on the whole not well-suited for doing this. It tends to be aimed at the individual who will exclaim 'cool!' when they see it, and be 'sold' on the product (like any other commodity), thus increasing the reach of the particular brand, but not necessarily serving the needs of the local community. I think the answer to the issue of conviviality in the classroom is to use the technology to increase the power of teachers to coordinate and manage their learning activities. I think it is these activities and the power relationships that sit behind them that are the key to the formation of deep attachments and conviviality - not just with each other, but with the subject knowledge that underpins the enterprise. This goes somewhat against the grain with regard to the recent trend for teachers to be 'facilitators' - but frankly, I'm fairly convinced this is a shallow interpretation of what teachers really do. Technologically, I think it means that the hurdle to be overcome is to find a way where global services can be properly 'served' locally by individual teachers for their students: the client-server relationship needs to be reinforced through the establishment of local servers which are ready-to-hand for teachers to coordinate the activities that they and their students care about. Learners are curious, want access to employment, personal development and empowerment. Teachers have knowledge, expertise, experience and understanding. The VARIETY (i.e. the collective complexity of something, or the number of possible states it can exist in) of the learners is greater than the VARIETY of a teacher. According to Ashby's Law of Requisite Variety (see http://en.wikipedia.org/wiki/Variety_(cybernetics)) the only way a relationship between teachers and learners can be managed is if the two sides of the VARIETY equation match. That means amplification of the teacher's VARIETY (maybe through technologies like the blackboard or indeed the classroom itself) and attenuation of the learners' VARIETY (through rules of the class, assignments, lectures, timetables, etc). To manage a viable relationship in the classroom, teachers must manage the variety (i.e. 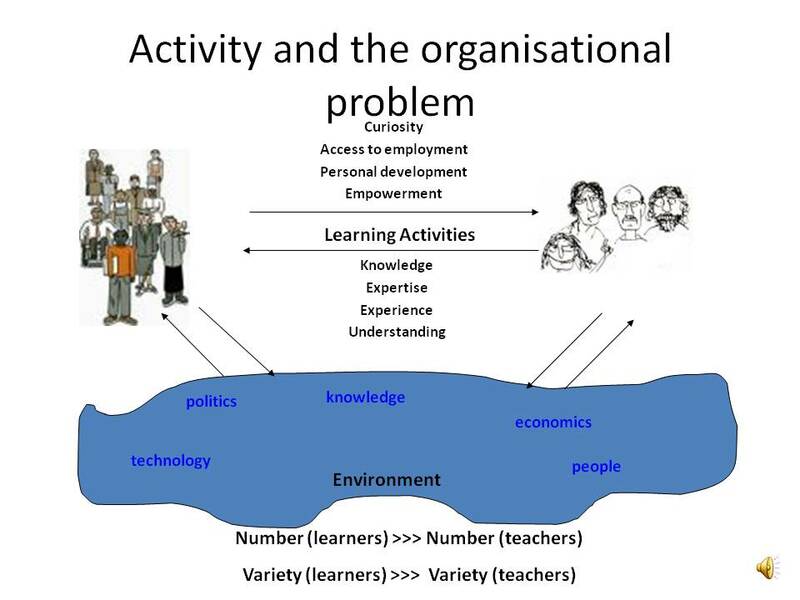 the collective complexity) of learners through coordinating activities, upholding rules of engagement, ensuring the provision of adequate resources, continually monitoring the state of the learners and adapting their approaches as necessary. The problem iTEC has is that it wants to encourage teachers to attenuate learners less in 'traditional ways' (i.e. boring the pants off them, sitting them in rows, etc). Instead iTEC wants teachers to allow learners to empower themselves with cool technologies, using widgets and other tools for learning journeys which are more learner-driven. But the problem is this unbalances the VARIETY equation. The viable relationship in the class cannot be maintained because with personal technologies the learners' VARIETY has increased even further, but the teacher has nothing to amplify their VARIETY to match it, and in giving pupils personal technologies they have surrendered some of their powers to attenuate the VARIETY of learners (and any school IT teacher will tell you how difficult it is to keep kids on task in a traditional computer room with PCs, let alone phones!). I think the ultimate consequence of this is that only a brave teacher who is prepared to take the risk of surrendering control in the hope of finding new ways to organise classrooms will allow new technologies into their teaching. The pressing question for ITEC then is "what can we do for teachers?" Either giving them new ways of attenuating the variety of learners who are using new tools, or amplifying the teacher more to give them more VARIETY"
I wonder if technology itself suggests a possible approach. Over the last 20 years there has been a tussle between server-based systems and client-based systems. More power to the client gives control problems at the centre; more power to the server creates blocks on creativity with clients. But this can be seen as a fluctuating pattern of variety management where Ashby's law is seen in all its glory. The Interactive Whiteboard is generally seen as a 'client with a big screen'. Consequently it doesn't really have any more power than any of the other 'clients' in the class (i.e. laptops, tablets, phones, etc). But this needn't be the case. If the Interactive Whiteboard was a server, and the clients in the classroom clients of the server, how would that change things? Technically it would amplify the teacher's variety allowing them to control the clients from a central point. That would of course have the converse effect of some attenuation of the client, but it would be a compromise that might work. Thinking through this idea, I've been exploring the possibility that Wookie Widget technology might provide a way where ready-to-hand widgets might act as classroom 'servers', with student widgets connecting to those servers. As Wookie develops inter-widget communication functionality, this seems to be a clear possibility. It would overcome some of the major technical hurdles to establishing local client-server networks. Currently local client-server networks are tricky: UDP messsaging might work within the classroom - but only if the Whiteboard machine was set up as a server, and the clients all connected to that server. But there would be no way of 'packaging' such a solution so that it could be made to work easily in any context. Inter-widget communication with server widgets would get around this problem - and I've been experimenting with some simple local client-server widget based solutions to test it out.. watch this space!